Ipca high brand equity of Domestic & International plant, manufacturing facilities from the worlds most vigilant regulatory bodies. Jr. Officer / Officer / Sr. Officer Tablet : B.Pharm, B.Sc., M.Pharm, M.Sc., with minimum 1-6 years of relevant experience in Granulation/ Compression/ Coating. Operator / Technician Tablet - 12th, ITI, with minimum 2-5 years of relevant experience in Compression & Coating only. Jr. Officer / Officer / Sr. 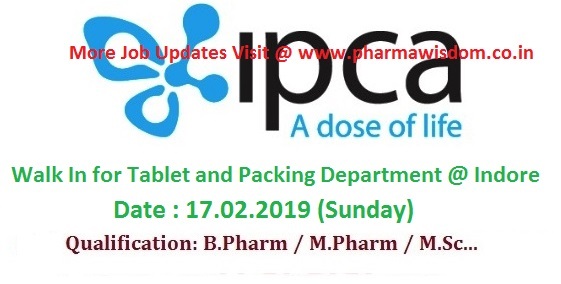 Officer - Packing : B.Pharm, B.Sc., M.Pharm, M.Sc., with minimum 1-6 years of relevant experience in Blister/ CVC/ Cartonater/ Documentation (QMS). Time:10.00 a.m. to 4.00 p.m.